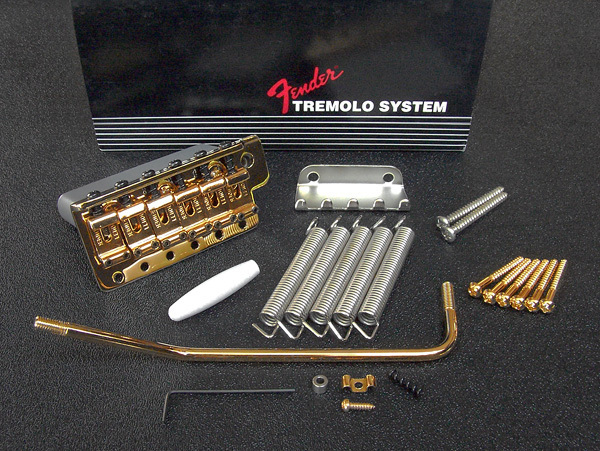 Genuine Fender® American Vintage Stratocaster® Tremolo Bridge Assembly System in Gold finish. Complete assembly has all of the vintage appointments for great tone and the correct look. Features "FENDER" stamped saddles, hardened steel tremolo block, string tree, tremolo arm with white plastic tip, 5 tremolo springs, tremolo claw and tremolo claw mounting screws. Black intonation screws/springs and black saddle height set screws. Vintage/USA specification 2-7/32" string spacing. Original 6-point attachment with outside mounting holes spacing of 2-7/32" on center. All mounting hardware is included.